There is an 'Alice in Wonderland' look about these huge buttercup-like wildflowers, whose heads are held high above a pillow of palmate leaves. Larger than most other members of the family Ranunculaceae, Globeflowers are hairless perennials and can reach a height of 50 to 70cm. The deeply-cut palmate leaves look very similar to those of Meadow Buttercup except that their upper and lower surfaces are smooth rather than downy. Five to fifteen incurved yellow sepals (which most people refer to as the 'petals') make up the cup of the flower, which is indeed globular and 3 to 5cm in diameter. Unlike other buttercups, the flowers usually remain closed or nearly so, and they are pollinated by flies that are small enough to creep in between the sepals to gain access. 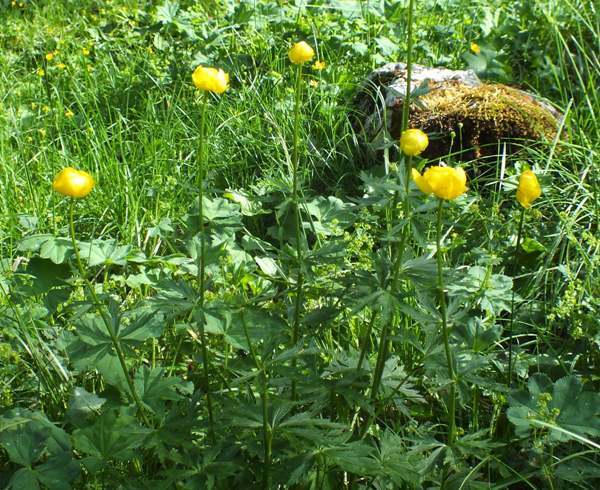 Globeflower seeds ripen between July and September and are transported to new locations by grazing animals, which appear to be unaffected by toxins known to occur in these plants. The seeds are deposited completes with an abundant supply of organic 'compost'! During the winter, when the stems have died back, a basal rosette of toothed palmate leaves, each with three to five large segments that are further divided, persists through to the following spring. This makes locating Globeflower plants quite easy at any time of the year. These lovely yellow wildflowers can be found in Britain and Ireland, but they very rare or not found other than in parts of Wales, northern Ireland, northern England and Scotland, where they are more common the further north you travel. 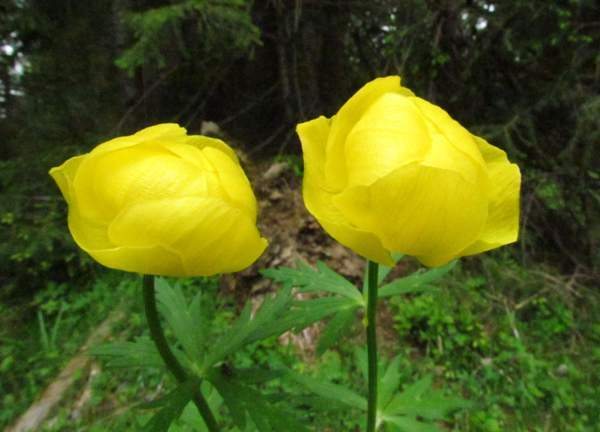 Globeflower is native to northern and central Europe but, being unable to cope with hot weather, in southern countries this wildflower is confined to cool, damp alpine regions. 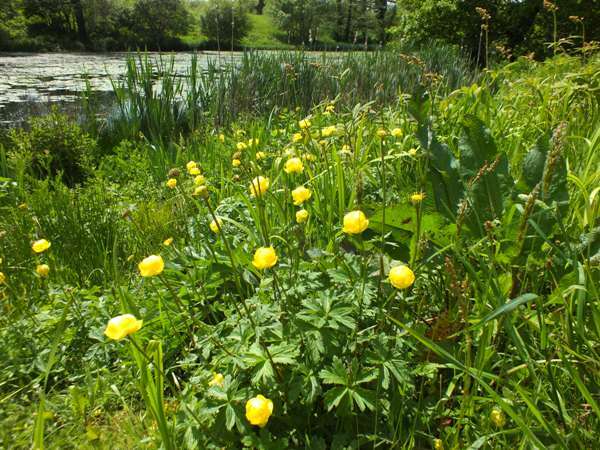 Globeflowers grow in sunlit or partially-shaded sites such as damp meadows, marshy gullies and the boggy margins of lakes, particularly where the soil is alkaline or at least neutral. In alpine regions in mainland Europe we see this species most often in sunny positions sheltered from the wind by hardwood trees or bushes. Globeflowers create a wonderful splash of colour during their blooming season in June, July and August. 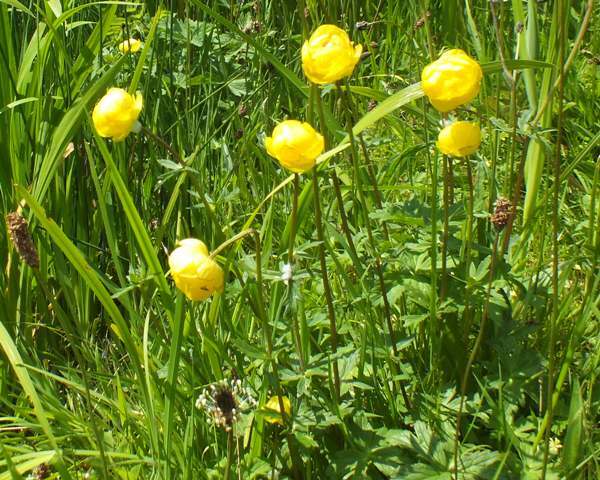 Globeflower is sometimes written as two words Globe Flower or hyphenated as Globe-flower. Greater Spearwort Ranunculus lingua also produces large yellow flowers, but they open out rather than remaining globular. The leaves of Greater Spearwort are lanceolate and untoothed. 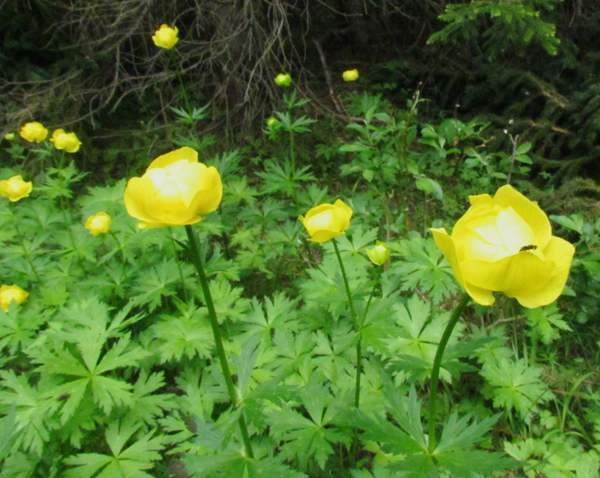 In North America Trollius laxus, a similar plant that is also known as Globeflower, is found over a large range. 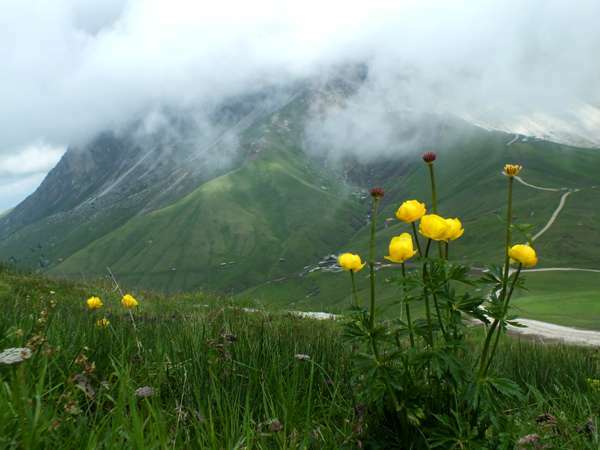 The pictures of Globeflowers shown on this page were photographed in West Wales, in northern Italy, and in the Julian Alps in Slovenia during June and early July.